Who has the best banh mi? We tried two Seattle newcomers: the much-hyped Lan Hue in the Chinatown International District and Mr. Saigon, across from Seattle University. The new wave of banh mi joints looks more like Subway or Chipotle. They resemble little of the first generation, holes in the wall often found in Asian business districts. They also make their own baguettes, with a bread-making station behind glass windows to make sure you and your Instagram followers know it. They have pastries, bubble tea and espresso. They are like mainstream coffeehouses with their communal tables and Wi-Fi passwords. One even carries a large beer selection. But all the pomps aside, it still comes down to one metric: how good are the banh mis? This week, we checked out the much-hyped Lan Hue in the Chinatown International District and a newbie, Mr. Saigon, on the outskirts of Capitol Hill. 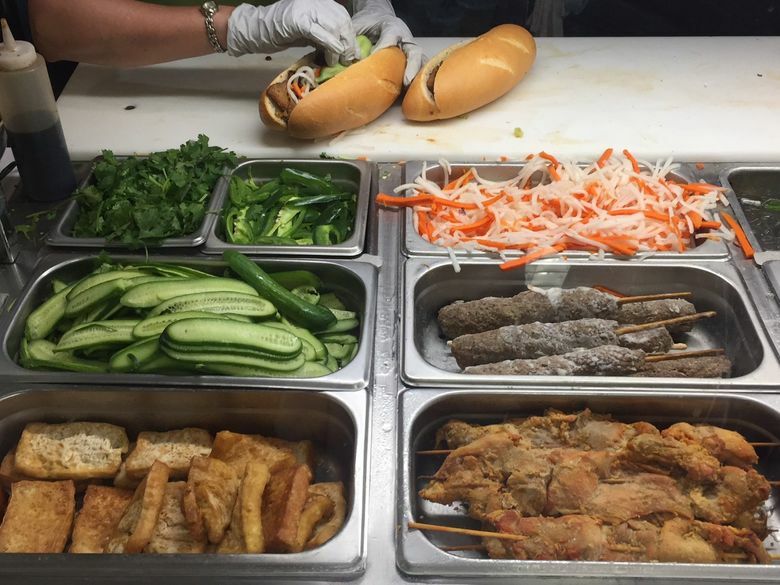 The players: Lan Hue, located in the Pacific Rim Center, just outside of Little Saigon, boasts one of the city’s largest banh mi menus: 17 pork, beef, chicken and tofu options. Sandwiches are $4 each or 6 subs for $20. 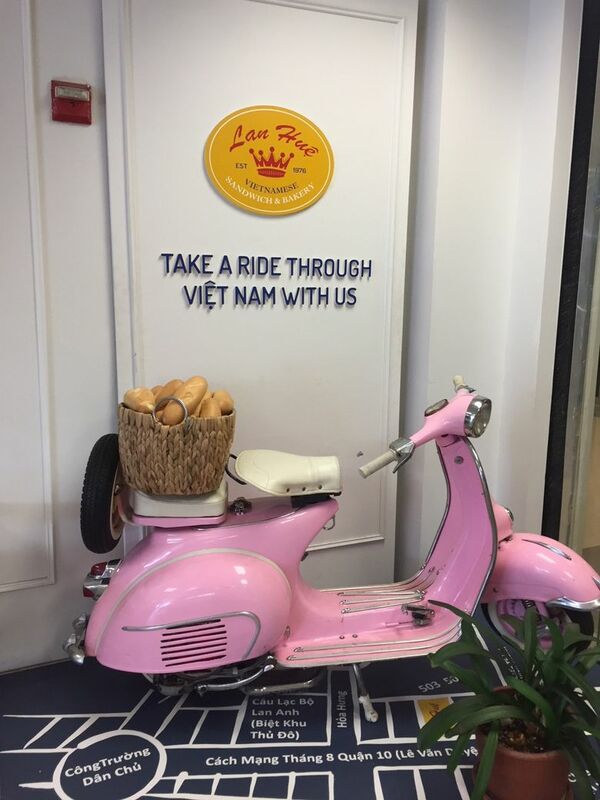 The subs are the traditional South Vietnamese style that are prevalent across the city. They come with the usual soy sauce and meat marinated in fish sauce. Mr. Saigon, across from the Seattle University campus, runs a shorter menu: four subs, a traditional cold cut and a grilled pork, along with two “modern” takes: a grilled chicken and a veggie version with tofu. They’re overstuffed, wet sandwiches that are heavily sauced — lots of Sriracha, hoisin and five-spice sauces. Sandwiches are $5.50 each; the special is five sandwiches for $20. Mr. Saigon also has a large beer selection from Rainier tallboys to the Asian staple of Tsingtao to Hite lager. 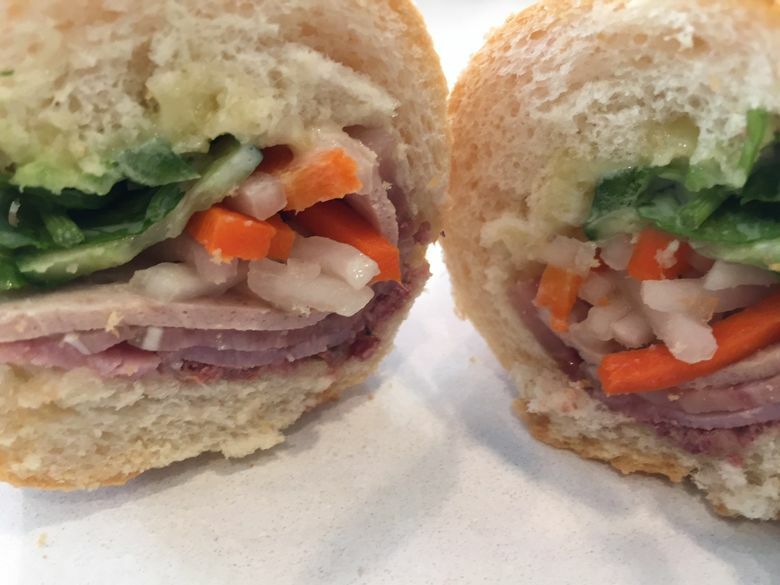 What to get at Lan Hue: The cold cut, listed as the no. 6 special, was the best overall from both spots. It also holds up well hours later, a good option if you’re packing for a Seahawks game. It’s tangy and sweet with a pungent saltiness, a whorl of deli slices (headcheese, ham and other cured Asian pork) fortified with pâté, a carnivore’s delight. It comes with the usual fixings: pickled daikon and carrots, cilantro, cucumber and jalapeño peppers. For hot sandwiches, the beef (listed as no. 1 on the menu) is the only hot option I recommend: the ground beef, shaped like sausage, has a charred crust with a moist interior. What to get at Mr. Saigon: The cold cut, listed as c-1 on the menu, has the usual layering of deli slices like Lan Hue’s, but the pâté is what makes this version sing, for a peppery, rich coating. Or request a banh mi with just the pâté and fresh mayo. The vegetarian option is substantial with firm tofu that tastes fresh. 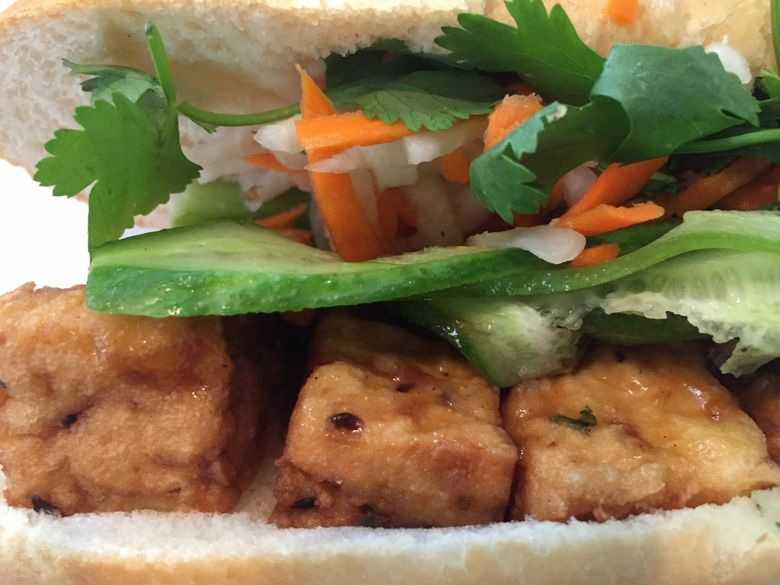 The tofu is deep-fried and comes with bright herb flavors doused with a sweet tang of a brown sauce. Overall: Both boast of baking their own bread daily, but neither baguette had that light, airy texture that’s the hallmark of street banh mis. With the exception of the beef sandwich at Lan Hue, the hot-sandwich options are subpar at both shops. Chicken was dry and stringy. The grilled pork lacked caramelization and had little of the charred crust and burnt ends that make grilled-pork banh mi a lunch staple. Both lack that big umami punch of Maggi sauce. Mr. Saigon’s sandwiches are overstuffed, but the proportions are out of balance, the sweet-and-sour fixings overwhelming the pâté and other savory components. Lan Hue’s deal of six subs for $20 is a steal. You can be a lunch hero and feed your entire office.